Half a career in the digital age. After thirty four years in this business, exactly half of them have come after the “digital revolution” entered photographer’s lives and altered everything. Yes, Kodak, inventor of the digital sensor, started selling digital conversions of Nikon and Canon SLRs much earlier than 17 years ago, in 1991 in fact. But at $25,000 to $35,000 each, these were well beyond the reach of most of us in the profession. Besides which, the need wasn’t there except for certain niches, primarily in the largest metropolitan areas and news agencies. Computers, the other end of the digital imaging world, involved mostly Macintosh at that time, running the earliest Photoshop editions. But that involved scanning film or prints to convert photos to digital for most of us for about another decade. I was struggling with this as early as 1993, when I got my first Mac, a Performa 400, but mostly sent the work to a processing agency for best results. But I digress…back to digital cameras. My first really effective digital camera was an Olympus E-10, a 4MP gem, bought in 2001. By later standards, it wasn’t really up to snuff as a professional tool with the exception of the then new website technology. However, it had great optics and allowed me to see the possibilities. It was a superb early effort by Olympus, and deserved not to fade away. The real game changer for most of us was the February 2003 introduction of the Canon 10D with 6.3 MP images. 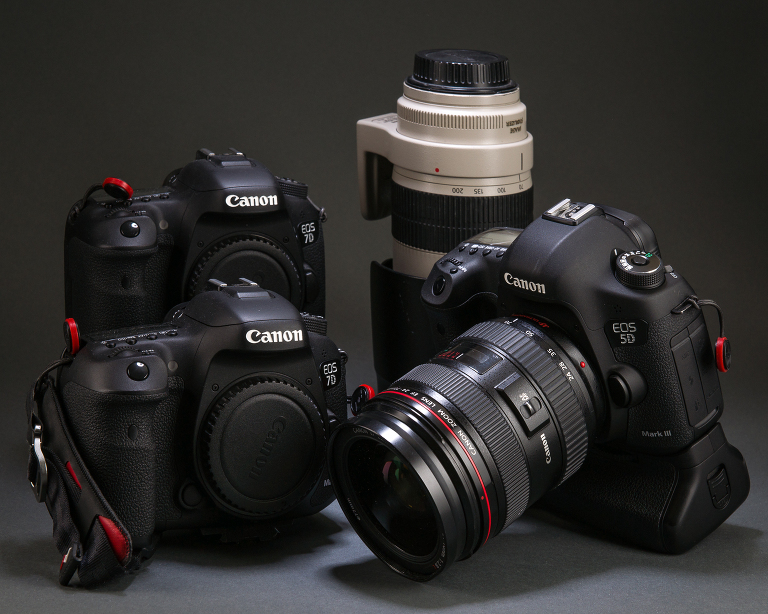 The 10D wasn’t Canon’s first digital release, their D30 and D60 (note the different naming nomenclature) bodies came earlier, but it was the 10D that greatly enhanced the rate of change. I was thrilled to obtain the first one in my 3 county area north of Pittsburgh in roughly late March 2003. In the intervening years, digital photography has been a love-hate topic for most professionals, and I’ve been right there with most of my peers, grousing about the influx of wannabes at the same time I’m extolling the virtues of my latest whiz-bang equipment investment (Sam Levitan, are your ears burning?). Thankfully, the grousing has been replaced by a renewed devotion to what brought me to this career choice in the first place: creating excellent imagery and providing clients with outstanding service. All of which brings me back to the title of this post: When Something Old is New Again. When you consider that the digital rubber finally hit the road in 2003, we have made incredible gains in the quality of capture in just over a dozen years! I love the quality of imagery possible with my workhorse Canon 5D MKIII and 7D MKII bodies and their superb lenses. But the “old” I’m talking about here was unveiled in 2008, only 5 years after the 10D shook the world with 6.3 MP. Amazingly, this camera blew the doors off what was considered possible by using a 24.6 MP sensor that had stunning clarity, sharpness and exceedingly clean color. To add insult to injury, it was sold by an electronics company, not a camera manufacturer, and for this reason, it was totally dismissed by many in the photographic community as not a reliable choice “They’ll drop cameras and be out of the market in 5 years” was the common refrain. Enter the full frame Sony a900/a850 DSLR. Here is a camera that was so far ahead of it’s time that I’ve just purchased a used one on a lark, because I’d heard very good things in the background behind the louder voices of the skeptics. It is quickly becoming my favorite in-studio camera. Not only that, but it is completely simpatico with the incredible Minolta AF lenses made 30-35 years ago, when Minolta introduced the first autofocus 35mm film SLRs in the world, only to be overtaken by their larger competitors within a few years. 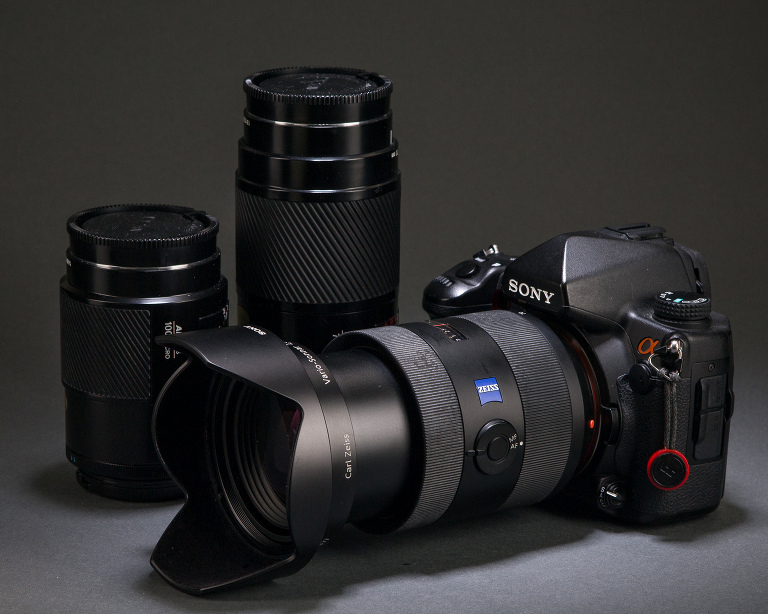 Sony has wisely kept the superb AF lens mount when they bought up Konica-Minolta, along with all of their world class lens designs, in pursuit of getting a foot in the door of the Digital Single Lens Reflex (DSLR) market. Sony had a series of less successful attempts before they created the a900/a850, but when they got it right, it was astoundingly right. Along with the widely available used Minolta glass, Sony has simply rebranded Minolta designs, updating with modern multi-coatings while keeping the designs and actual glass components. There is also a collaborative effort with Zeiss, another world class lens maker, to fill the gaps in what modern professionals demand in a line of lens products. Make no mistake though; when used with consideration for the older multi-coatings, there are a lot of excellent optics available. I’ve found that, straight out of my a850, the images are clean and accurate to a degree I had not anticipated in any camera, let alone a 10 year old body. I have now purchased a half dozen used Minolta lenses as well as the outstanding Sony-Zeiss 24-70 f2.8. Frankly, I couldn’t be happier with this unexpected windfall. It may not be completely possible to see the differences in these photos in the online environment, but here in the studio on my monitor, there is just a little more richness and pop to the picture of the Canons, as taken with the Sony. Old is new again. I love it! « Season’s Greetings to You All!